Shymeka Tart, inset,was fatally stabbed in the Coney Island House Wednesday night, police said. CONEY ISLAND — A simmering feud between teenaged boys turned deadly when one of their mother’s took out a knife and fatally stabbed the other boy's mom inside the Coney Island Houses Wednesday night, police sources said. 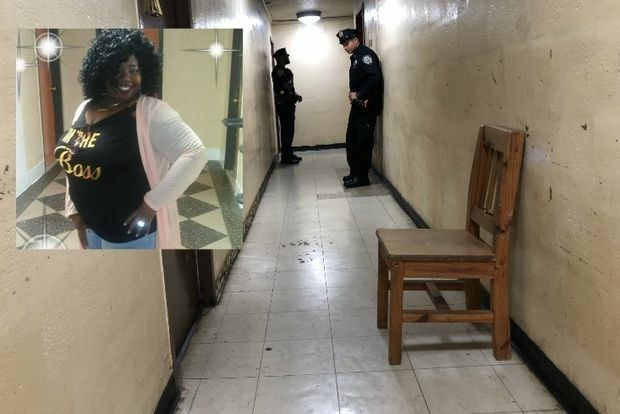 Latrisha Moore, 40, knifed Shymeka Tart, 31, in the stomach in the seventh-floor hallway of 2007 Surf Ave. near West 20th Street, around 9:30 p.m., police said. "We heard screaming, two women screaming," said neighbor Dmitry Sukhodrev, 71. "It went on for about half-an-hour. It was terrible." Tart, who lived on the fifth floor, was taken to Coney Island Hospital but could not be saved, police said. Authorities did not have any further details regarding the circumstances surrounding the feud between to two young men. Moore, who lived on the seventh floor, was arrested at the scene and later charged with murder and criminal possession of a weapon, the NYPD said. She has two prior assault arrests, including one in 2013 where she hit a 24-year-old woman with a glass bottle, cutting the victim's forehead and right arm, according to police. She hadn't been arraigned on the murder charge as of Friday morning, records show. It's the second time in four years that tragedy has struck the building. In April 2014, NYPD Officers Dennis Guerra and Rosa Rodriguez responded to an arson on the 13th floor of the complex and were overcome by smoke. Guerra was killed and Rodriguez hospitalized for days. Marcell Dockery, who was 16 at the time, was convicted of murder and is facing 19 years to life in prison for that crime.